Bulbous perennial with oblong, mid-green leaves 4 to 6 inches long, marbled purplish brown. 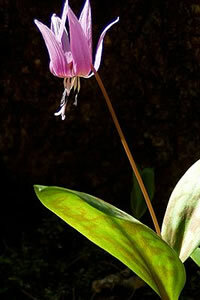 In spring, bears solitary white, pink or lilac flowers 1-1/2 inches across with purple anthers. 4-6 inch height and spread. Ideal for a woodland garden. Also suitable for naturalizing in thin grass, or for borders and containers. For maximum freshness, please keep seed refrigerated in its original packaging until it is time to plant. Sow seed as soon as your order arrives. Plant in containers and keep in a cold frame or similar sheltered area. Grow in fertile, humus-rich, well-drained soil in light, dappled shade. Do not allow soil to dry out. Divide established clumps after flowering every few years.